The benefits of multi-layer printing especially for back-lit printing. James comments; "Versatility when it comes to media is amazing through the UCJV. We have produced some Gold and Chrome jobs for customers they have been blown away with. These different materials we have struggled to get these sort of results from solvent printers." 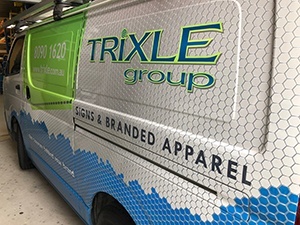 Trixle Group - Look out for this well branded van. The UCJV has increased productivity significantly with instant cure improving turnaround times. White printing we are so impressed with, this give us so many different options for our customers. LED UV Curing technology opens up a wider choice of media our customers have really experienced these advantages. James explained; The UCJV300 has really met our expectations. 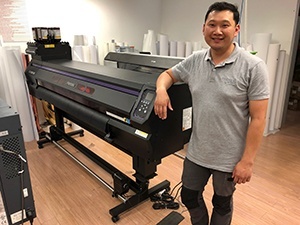 This technology has filled a gap in our business from our existing printing technologies which means more opportunity to sell solutions to our customers. 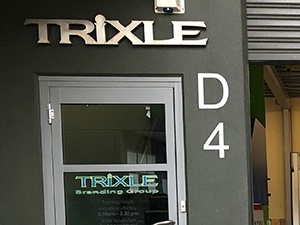 IndustryEstablished in 2005, Trixle Group is a full-service strategic branding business, supplying a range of business branding needs to a diverse range of clients in a wide range of industries.